Made on Saltspring Island in the Gulf Islands of British Columbia by long-time instrument maker Grant Wickland, with some additional work/customization done by our luthiers here at Mountain Fruit. These include replacing the synthetic head with a real skin one and changing the strings over to nylon, as well as some refining of the neck profile to take comfort and playability to the next level. So far we have never been disappointed with the improvement in tone that a real goat skin head brings to a banjo. The nylon strings and the fretless neck give access to micro-tone playing and slides in a very mellow and lyrical tone, but this instrument still plenty of the volume and clarity that banjo players love. 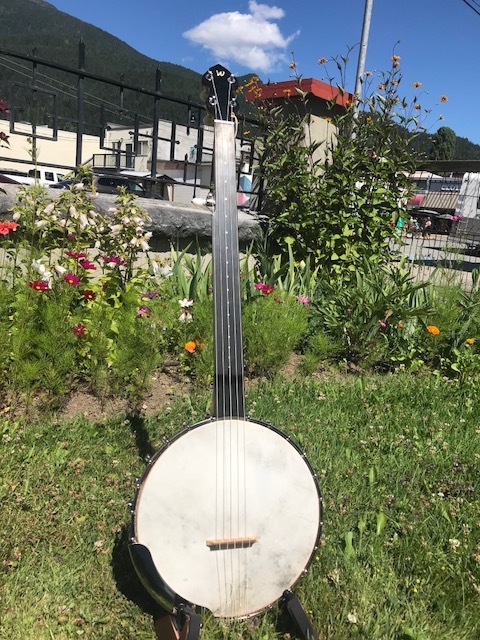 This banjo certainly stimulates a new approach to playing banjo!